The Berlin Wall (German: Berliner Mauer), an iconic symbol of the Cold War, was initially constructed starting on August 13, 1961, and dismantled in the weeks following November 9, 1989. Part of the Iron Curtain, the Berlin Wall was the most prominent part of the German Democratic Republic’s border system. Conceived by the East German administration of Walter Ulbricht and approved by Soviet leader Nikita Khrushchev, the wall was a long separation barrier between West Berlin and East Germany (the German Democratic Republic), which closed the border between East and West Berlin for a period of 28 years. It was built during the post-World War II period of a divided Germany, in an effort to stop the drain of labor and economic output associated with the daily migration of huge numbers of professionals and skilled workers between East and West Berlin, and the attendant defections, which had political and economic consequences for the Communist bloc. It effectively decreased emigration (escapes; Republikflucht in German) from 2.5 million between 1949 and 1962 to 5,000 between 1962 and 1989. However, the creation of the Wall was a propaganda disaster for East Germany and for the communist bloc as a whole. It became a key symbol of what Western powers regarded as Communist tyranny, particularly after the high-profile shootings of would-be defectors. Political liberalization in the late 1980s, associated with the decline of the Soviet Union, led to relaxed border restrictions in East Germany, culminating in mass demonstrations and the fall of the East German government. When a government statement that crossing of the border would be permitted was broadcast on November 9, 1989, masses of East Germans approached and then crossed the wall, and were joined by crowds of West Germans in a celebratory atmosphere. 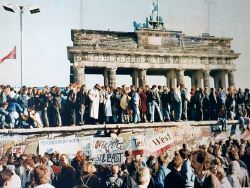 The Wall was subsequently destroyed by a euphoric public over a period of several weeks, and its fall was the first step toward German reunification, which was formally concluded on October 3, 1990. Symbolically, the tearing down of the wall has come to represent the collapse of Communism in East Europe. By December 1991, the Soviet Union had been dissolved, and by the end of 1992 every communist regime had collapsed except China, North Korea and Cuba. After the end of World War II in Europe, what territorially remained of pre-1945 Germany had been divided into four occupation zones. 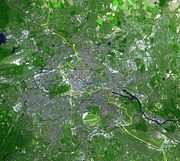 The old capital of Berlin, as the seat of the Allied Control Council, was itself subdivided into the same four occupation zones. 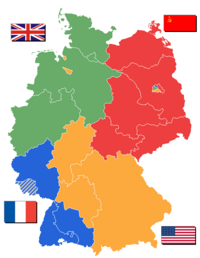 Although the intent was for the occupying powers to govern Germany together in the borders from 1947, the advent of Cold War tension caused the French, British and American zones in the West to be formed into the Federal Republic of Germany (and West Berlin) in 1949, excluding the Soviet zone which then formed the German Democratic Republic (including East Berlin) in the East the same year. From 1948 onwards, West Germany developed into a western capitalist country with a social market economy ("Soziale Marktwirtschaft" in German) and a democratic parliamentary government. Prolonged economic growth starting in the 1950s fuelled a 30-year "economic miracle." Across the inner-German border, East Germany established an authoritarian government with a Soviet-style planned or command economy. While East Germany became the richest, most advanced country in the Eastern bloc, many of its citizens still looked to the West for political freedoms and economic prosperity. The flight of growing numbers of East Germans to non-communist countries via West Berlin led to East Germany erecting the GDR border system (of which the Berlin Wall was a part) in 1961 to prevent any further exodus. From 1949 to 1961 huge numbers of professionals and skilled workers migrated daily between East and West Berlin—earning the name "Grenzgänger"—frequently because of lucrative opportunities connected with rebuilding western Europe funded by the Marshall Plan. Furthermore, many West Berliners traveled into East Berlin to do their shopping at state-subsidized stores, where prices were much lower than in West Berlin. This drain of labor and economic output threatened East Germany with economic collapse. This had ramifications for the whole Communist bloc and particularly the Soviet Union, because East Germany's economy was being subsidized by the Soviet government, and simultaneously, the now-threatened East German production was responsible for all war reparations to Poland and the Soviet Union. The impetus for the creation of the Berlin Wall came from East German leader Walter Ulbricht, approved by Soviet leader Nikita Khrushchev but with conditions imposed. Ulbricht's proposal for a second air blockade was refused, and the construction of a barrier was permitted provided that it was composed at first of barbed wire. If the Allies challenged the barrier, the East Germans were to fall back and were not to fire first under any circumstances. 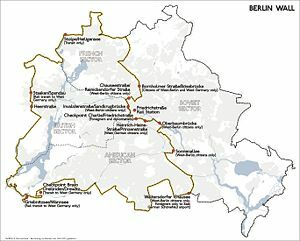 Construction of 45 kilometers (28 miles) around the three western sectors began on Sunday, August 13, 1961, in East Berlin. That morning the zonal boundary had been sealed by East German troops. The barrier was built by East German troops and workers, not directly involving the Soviets. It was built a little way inside East German territory to ensure that it did not encroach on West Berlin at any point; if one stood next to the West Berlin side of the barrier (and later the wall), one was actually standing on East Berlin soil. Some streets running alongside the barrier were torn up to make them impassable to most vehicles, and a barbed-wire fence was erected, which was later built up into the full-scale wall. It physically divided the city and completely surrounded West Berlin. During the construction of the wall, the National People's Army and Combat Groups of the Working Class soldiers stood in front of it with orders to shoot anyone who attempted to defect. Additionally, the whole length of the border between East and West Germany was closed with chain-fences, walls, minefields, and other installations. Many families were split. Many East Berliners were cut off from their jobs and from chances for financial improvement; West Berlin became an isolated enclave in a hostile land. West Berliners demonstrated against the wall, led by their mayor Willy Brandt, who strongly criticized the United States for failing to respond. Allied intelligence agencies had hypothesized about a wall to stop the flood of refugees but the main candidate for its location was around the perimeter of the city. U.S. President John F. Kennedy had accepted in a speech on July 25, 1961  that the United States could only really hope to defend West Berliners and West Germans; to attempt to stand up for East Germans would only result in an embarrassing climbdown. Accordingly, the administration made polite protests at length via the usual channels, but without fervor, even though it was a violation of the postwar Four Powers Agreements, which gave the United Kingdom, France and the United States a say over the administration of the whole of Berlin. Indeed, a few months after the barbed wire went up, the U.S. government would inform the Soviet government that it accepted the wall as "a fact of international life" and would not challenge it by force. 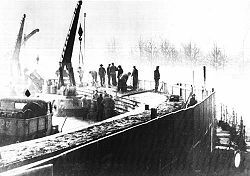 The East German government claimed that the Wall was an "anti-fascist protection barrier" ("antifaschistischer Schutzwall"), intended to dissuade aggression from the West. However, this position was viewed with skepticism even in East Germany; its construction had caused considerable hardship to families divided by the wall, and the Western view that the wall was a means of preventing the citizens of East Germany from entering West Berlin was widely seen as being the truth. It was clear both that West German morale needed more and that there was a serious potential threat to the viability of West Berlin. If West Berlin fell after all the efforts of the Berlin Airlift, how could any of America's allies rely on her? On the other hand, in the face of any serious Soviet threat, an enclave like West Berlin could not be defended except with nuclear weapons. As such, it was vitally important for the Americans to show the Soviets that they could push their luck no further. Accordingly, General Lucius D. Clay, who was deeply respected by Berliners after commanding the American effort during the Berlin Airlift (1948–1949), and was known to have a firm attitude towards the Soviets, was sent to Berlin with ambassadorial rank as Kennedy's special advisor. He and Vice President Lyndon B. Johnson arrived at Tempelhof International Airport on the afternoon of Saturday, August 19. They arrived in a city defended by what would soon be known as the "Berlin Brigade," which then consisted of the 2nd and 3rd Battle Groups of the 6th Infantry, with Company F, 40th Armor. The battle groups were pentatomic, with 1,362 officers and men each. On August 16, Kennedy had given the order for them to be reinforced. Early on August 19, the 1st Battle Group, 18th Infantry (commanded by Col. Glover S. Johns, Jr.) was alerted. On Sunday morning, lead elements in a column of 491 vehicles and trailers carrying 1,500 men divided into five march units and left the Helmstedt-Marienborn checkpoint at 6:34 A.M. At Marienborn, the Soviet checkpoint next to Helmstedt on the West German/East German border, U.S. personnel were counted by guards. The column was 160 kilometers (100 miles) long, and covered 177 kilometers (about 110 miles) from Marienborn to Berlin in full battle gear, with East German traffic police watching from beside trees next to the autobahn the entire way. The front of the convoy arrived at the outskirts of Berlin just before noon, to be met by Clay and Johnson, before parading through the streets of Berlin to an adoring crowd. At 4:00 A.M. on Monday, August 21, Johnson left a visibly reassured West Berlin in the hands of Gen. Frederick O. Hartel and his brigade, now of 4,224 officers and men. Every three months for the next three and a half years, a new American battalion was rotated into West Berlin by autobahn to demonstrate Allied rights. The creation of the wall had important implications for both Germanies. By stemming the exodus of people from East Germany, the East German government was able to reassert its control over the country. However, the wall was a propaganda disaster for East Germany and for the communist bloc as a whole. It became a key symbol of what Western powers regarded as Communist tyranny, particularly after the high-profile shootings of would-be defectors (which were later treated as acts of murder by the reunified Germany). In 1987, President Ronald Reagan gave a famous speech at the Brandenburg Gate, at which he challenged Mikhail Gorbachev to "tear down this wall." In West Germany, dismay that the Western powers had done nothing to prevent the wall's creation led directly to the policy of Ostpolitik or rapprochement with the east, in an effort to stabilize the relationship of the two Germanies. The wall was over 155 kilometers (96 miles) long. In June 1962, work started on a second parallel fence up to 91 meters (100 yards) further in, with houses in between the fences torn down and their inhabitants relocated. A no man's land was created between the two barriers, which became widely known as the "death strip." It was paved with raked gravel, making it easy to spot footprints left by escapees; it offered no cover; it was mined and booby-trapped with tripwires; and, most importantly, it offered a clear field of fire to the watching guards. The "fourth generation wall," known officially as "Stützwandelement UL 12.11" (Retaining wall element UL 12.11), was the final and most sophisticated version of the Wall. Begun in 1975 and completed about 1980, it was constructed from 45,000 separate sections of reinforced concrete, each 3.6 meters (12 feet) high and 1.2 meters (4 feet) wide, and cost 16,155,000 East German marks. The top of the wall was lined with a smooth pipe, intended to make it more difficult for escapers to scale it. It was reinforced by mesh fencing, signal fencing, anti-vehicle trenches, barbed wire, over 116 watchtowers, and twenty bunkers. This version of the wall is the one most commonly seen in photographs, and surviving fragments of wall in Berlin and elsewhere around the world are generally pieces of the fourth-generation wall. 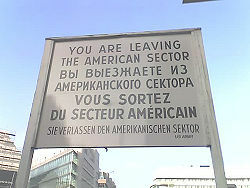 Several other border crossings existed between West Berlin and surrounding East Germany. These could be used for transit between West Germany and West Berlin, for visits by West Berliners into East Germany, for transit into East Germany's next door countries Poland, Czechoslovakia, Denmark, and for visits by East Germans into West Berlin carrying a permit. After the 1972 agreements, new crossings were opened to allow West Berlin waste be transported into East German dumps, as well as some crossings for access to West Berlin's exclaves. Four motorways usable by West Germans connected West Berlin to West Germany, the most famous being the Berlin-Helmstedt autobahn, which entered East German territory at the town of Helmstedt (Checkpoint Alpha) and connected to Berlin at Dreilinden (Checkpoint Bravo) in southwestern Berlin. Access to West Berlin was also possible by railway (four routes) and by boat using canals and rivers. Foreigners frequently and legally crossed the wall, and the East Germans welcomed their hard currency. They were always subject to careful checks both entering and leaving. When exiting, the police would typically run a mirror under each vehicle to look for persons clinging to the undercarriage. East Germans were occasionally given permission to cross, particularly when they were too old to work. At the border section in Potsdam, the captured U-2 pilot Gary Powers was traded for Russian spy Rudolf Abel. One location where Westerners could cross the border was Friedrichstraße station in East Berlin. When the wall was erected, Berlin's complex public transit networks, the Berlin S-Bahn (streetcar) and Berlin U-Bahn (subway), were divided with it. Some lines were cut in half and many stations were shut down. Three Western lines traveled through brief sections of East Berlin territory, passing through eastern stations (called Geisterbahnhöfe, or ghost stations) without stopping. Both the eastern and western networks converged at Friedrichstraße, which became a major crossing point for those (mostly Westerners) with permission to cross. 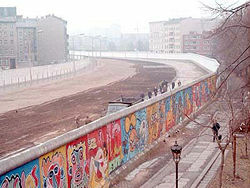 During the Wall's existence there were around five thousand successful escapes (a form of illegal emigration) into West Berlin. Varying reports claim either 192 or 239 people were killed trying to cross and many more injured. Early successful escapes involved people jumping the initial barbed wire or leaping out of apartment windows along the line but these ended as the wall improved. Later successful escape attempts included long tunnels, sliding along aerial wires, flying ultralight aircraft, and even one man who drove a very low sports car underneath a barricade at Checkpoint Charlie. Another airborne escape was by Thomas Kruger, who landed a Zlin Z-42M light aircraft of the Gesellschaft für Sport und Technik, an East German youth military training organization, at the Royal Air Force base at Gatow. His aircraft, registration DDR-WOH, was dismantled and returned to the East Germans by road, complete with humorous slogans painted on by Royal Air Force airmen such as "Wish you were here" and "Come back soon." DDR-WOH is still flying today, but under a different registration. The most notorious failed attempt was that of Peter Fechter, who was shot and left to bleed to death in full view of the western media, on August 17, 1962. The last person to be shot dead while trying to cross the border was Chris Gueffroy on February 6, 1989. The Fall of the Berlin Wall, 1989. The photo shows a part of a public photo documentation wall at the Brandenburg Gate, Berlin. On August 23, 1989, communist Hungary removed its border restrictions with Austria, and in September more than 13,000 East German tourists in Hungary escaped to Austria. Mass demonstrations against the government in East Germany began in the autumn of 1989. The long-time leader of East Germany, Erich Honecker, resigned on October 18, 1989, and was replaced by Egon Krenz a few days later. Honecker had predicted in January of that year that the wall would stand for a "hundred more years" if the conditions which had caused its construction did not change. He would be wrong by more than 99 years. The new Krenz government decided to allow East Berliners to apply for visas to travel to West Germany. Günter Schabowski, the East German Minister of Propaganda, had the task of announcing this; however he had been on vacation prior to this decision and had not been fully updated. Shortly before a press conference on November 9, 1989, he was handed a note that said that East Berliners would be allowed to cross the border with proper permission, but gave no further instructions on how to handle the information. These regulations had only been completed a few hours earlier, and were to take effect the following day, so as to allow time to inform the border guards. However, nobody had informed Schabowski. He read the note out loud at the end of the conference and when asked when the regulations would come into effect, he assumed it would be the same day based on the wording of the note and replied, "As far as I know effective immediately, right now." Tens of thousands of East Berliners heard Schabowski's statement live on East German television and flooded the checkpoints in the wall demanding entry into West Berlin. The surprised and overwhelmed border guards made many hectic telephone calls with their superiors, but it became clear that there was no way to hold back the huge crowd of East German citizens short of dispatching the army with lethal force, as the vastly outnumbered border guards had only been equipped for regular duty. The guards and the East Berlin government were not willing to use lethal force, so in face of the escalating crowd safety issues the guards finally yielded, opening the checkpoints and allowing people through with little or no identity checks. The ecstatic East Berliners were soon greeted by West Berliners on the other side in a celebratory atmosphere, and the bars near the wall spontaneously gave out free beer. November 9 is thus considered the date the wall fell. In the days and weeks that followed people came to the wall with sledgehammers in order to chip off souvenirs, demolishing lengthy parts of it in the process. These people were nicknamed "Mauerspechte" (wall peckers). 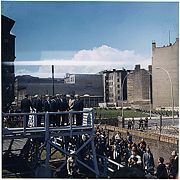 The East German regime announced the opening of ten new Berlin border crossings the following weekend, including some in symbolic locations (Potsdamer Platz, Glienicker Brücke, Bernauer Straße). Crowds on both sides waited there for hours, cheering at the bulldozers who took the wall elements away to make way for new roads. Photos and television footage of these events is sometimes mislabelled "dismantling of the wall," even though it was "merely" the construction of new crossings. New border crossings continued to be opened through summer 1990, including the most famous one at the Brandenburg Gate on December 22, 1989. West Germans and West Berliners were allowed visa-free travel starting December 23, 1989. Until then they could visit East Germany and East Berlin at the restrictive conditions prevalent before, which involved application for a visa several days or weeks in advance, and obligatory exchange of at least 25 DM per day of their planned stay, all of which hindered spontaneous visits. Thus, in the weeks between November 9 and December 23, East Germans could travel "more freely" than Westerners. Technically the wall remained guarded for some time after November 9, even though at an ever-decreasing intensity. In the first months, the East German military even tried to repair some of the damages done by the "wall peckers." Gradually these attempts ceased, and guards became more and more lax, tolerating the increasing demolitions and "unauthorized" border crossing through the holes. On June 13, 1990, the official dismantling of the wall by the East German military began in Bernauer Straße. On July 1, the day East Germany adopted the West German currency, all border controls ceased, although the inter-German border had become meaningless for some time before that. The dismantling continued to be carried out by military units (after reunification under the Bundeswehr) and took until November 1991. Only a few short sections and watchtowers were left standing as memorials. On December 25, 1989, Leonard Bernstein gave a concert in Berlin celebrating the end of the wall, including Ludwig van Beethoven's Symphony No. 9 (Ode to Joy), with the chorus' word "Joy" (Freude) changed to "Freedom" (Freiheit). Roger Waters performed the Pink Floyd album The Wall in Potsdamer Platz on July 21, 1990, with guests including the Scorpions, Bryan Adams, and Van Morrison. David Hasselhoff performed his song "Looking for Freedom," which was very popular in Germany at that time, while standing on the Berlin Wall. Some believe November 9 would have made a suitable German national holiday, since it both marks the emotional apogee of East Germany's peaceful revolution and is also the date of the declaration of the first German republic, the Weimar Republic, in 1918. However, November 9 is also the anniversary of the infamous Kristallnacht pogroms of 1938 and, therefore, October 3 was chosen instead. Part of this decision was that the East German government wanted to conclude reunification before East Germany could celebrate a forty-first anniversary on October 7, 1990. The fall of the wall considerably changed traffic patterns in the city and the M-Bahn. An experimental magnetic levitation train system around 1.6 kilometers (1 mile) in length was demolished just months after its official opening in July 1991, as it used part of the track bed of an underground line previously severed by the wall. Little is left of the wall in Berlin, which was destroyed almost everywhere, except for three locations: an 80-meter (300 ft) section near Potsdamer Platz, a longer section along the Spree River near the Oberbaumbrücke (nicknamed the East Side Gallery), and a third section in the north at Bernauer Straße, which was turned into a memorial in 1999. Even the parts that are left standing no longer accurately represent the wall's original appearance—they are badly damaged (since so many people attempted to pick up "original Berlin Wall" pieces), and today graffiti is prevalent on the eastern side of the wall, which obviously would not have been possible while the wall was actually guarded by the armed soldiers of East Germany. Previously, graffiti was exclusively on the western side. Fragments of the wall both with and without certificates of authenticity are a staple on the online auction service eBay as well as German souvenir shops and are found on mantlepieces and desktops throughout the world. Even people in the U.S. and China wanted a fragment of this time period. A small portion of the wall can be seen at Westminster College in Fulton, Missouri. Westminster College is known for drawing important world leaders—Winston Churchill (he gave his famous Iron Curtain speech at Westminster College), Ronald Reagan, George H. W. Bush, and Margaret Thatcher, among others. The piece of the wall became part of the Winston Churchill Memorial Library. One year after the fall of the Berlin Wall, artist Edwina Sandys, granddaughter of Winston Churchill, proposed the idea of placing a piece of the wall at the Westminster College campus. With the support of Westminster College, Sandys and her husband, Richard Kaplan, met with officials in East Berlin in February 1990. 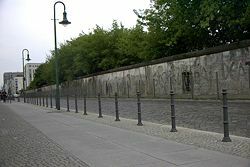 Upon arrival in Berlin, the couple realized their plans to secure large portions of the wall would be costly, as 4-foot-wide sections were selling at a cost of $60,000 to $200,000. This obstacle, however, was solved when officials, impressed by the idea of a Berlin Wall monument being erected near the site of Churchill's 1946 "Iron Curtain" speech, allowed Sandys to choose eight sections as a gift to the college. Sandys chose her sections from an area near the Brandenburg Gate, frequented by artists, because of the dramatic color of the graffiti. The repeated use of the word "unwahr," within the sections, which in German means "untrue," also appealed to her. On November 9, 1990, after a nine-month effort, the "Breakthrough" sculpture stood appropriately in the foreground of the College's Winston Churchill Memorial and Library. Joined by former President Ronald Reagan, Senator John Ashcroft and German Minister Plenipotentiary Fritjof von Nordenskjoeld, Sandys introduced her sculpture to the assembled crowd. Fourty-four years after her grandfather warned of an "iron curtain," the wide open doors of "Breakthrough" provided a concrete image of the newly realized freedom in Eastern Europe. Fifteen years after the fall of the Berlin Wall, a private museum rebuilt a 200-meter (656 foot) section close to Checkpoint Charlie, although not in the location of the original wall. They also erected over one thousand crosses in memory of those who had died attempting to flee to the West. The memorial was installed in October 2004 and demolished in July 2005. Even now, some years after reunification, there is still talk in Germany of continuing cultural differences between East and West Germans (colloquially Ossis and Wessis), sometimes described as "Mauer im Kopf" ("The wall in the head"). 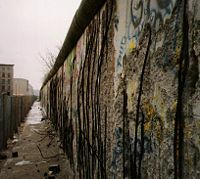 A September 2004 poll found that 25 percent of West Germans and 12 percent of East Germans wished that East Germany and West Germany were again cut off by the Berlin Wall. Many German public figures have called these numbers "alarming." ↑ Furlong, Ray (July 5, 2005). Berlin Wall memorial is torn down. BBC News. Retrieved 2006-02-23. ↑ Reuters (September 8, 2004). One in 5 Germans wants Berlin Wall rebuilt. MSNBC. Retrieved 2006-02-23. Catudal, Honoré M. John F. Kennedy and the Berlin Wall Crisis: A Case Study in US Decision Making. West Berlin: Berlin Verlag, 1980 ISBN 387061160X Foreword by Martin J. Hillenbrand; sponsored by the Atlantic Council of the United States. Kennedy, John F. Speech, July 24, 1961. This page was last modified on 26 March 2018, at 23:18.